County Manager Mark Schwartz has recommended to the County Board ways to use unspent “close-out” funds from the County’s 2018 fiscal year, which ended on June 30. 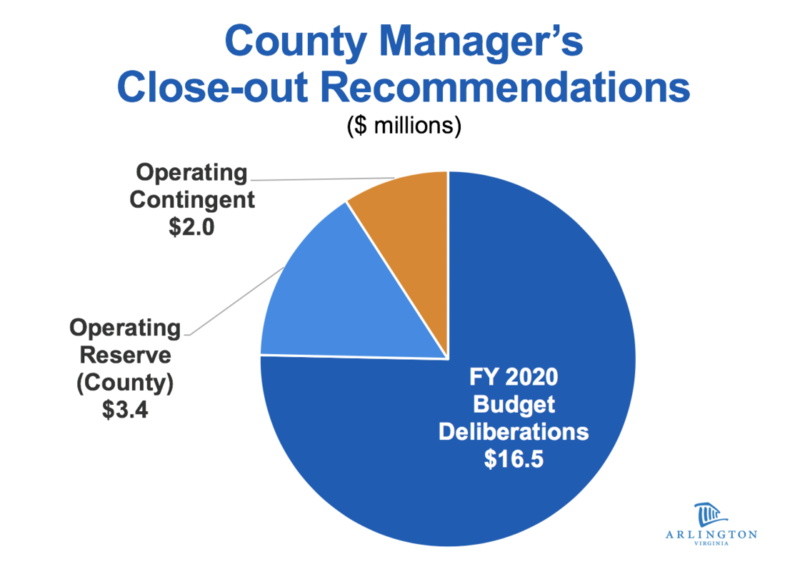 The recommendations focus on shoring up the County’s finances and providing flexibility for closing an anticipated budget gap for the coming 2020 fiscal year. Providing Operating Contingent for Current Fiscal Year: $2.0 million to address unforeseen needs that arise in FY 2019 without reprioritizing or cutting other programs. This could include unanticipated consultant needs, software licensing requirements and/or facility repairs. Providing Flexibility for FY 2020 Budget Deliberations: $16.5 million to provide flexibility in closing the County’s anticipated budget gap for FY 2020, with a focus on supporting one-time needs rather than new initiatives or ongoing costs. Final use of the funds would be determined by the County Board after the Manager outlines options in his proposed budget in February. In recent years the County has generated operating surpluses at the end of its fiscal year. The FY 2018 budget was adopted in April 2017, and over the months of July 2017 through June 2018 revenue and expenditures changed, as is typical. Arlington’s operating surpluses have been decreasing over the past few years — the result of many factors, including better budget execution and financial management practices. This year saw a spike, however, driven by savings from a slowdown in County hiring, with managers holding vacant positions open in the face of looming budget pressures. The County also realized about $7 million in savings on employee healthcare, mainly due to lower-than-expected claims payments. While declining operating surpluses are a sign of good financial practices, it’s important to maintain healthy end-of-year fund balances, mostly in the form of reserves. The County ended FY 2018 with a total end-of-year General Fund balance of $181.9 million — about 14.7 percent of total General Fund revenues. The biggest portion, about $72.8 million, was the County’s reserves. The next biggest portion was $54 million for the Affordable Housing Investment Fund, which provides loans to developers to build or preserve affordable housing in the County. 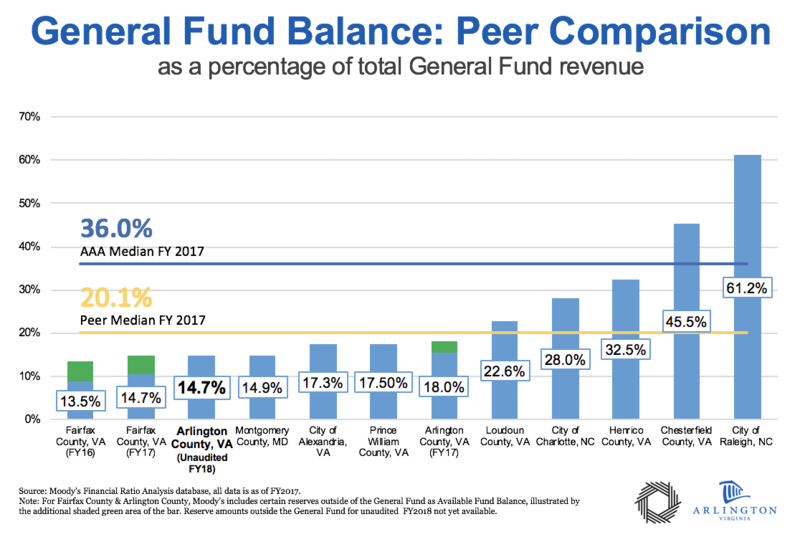 This is the fourth consecutive year that Arlington County has seen its fund balance decline. Over the same period, peer governments have maintained higher fund balances. Other triple-AAA counties in the U.S. have fund balances equaling 36 percent of total General Fund revenues, on average. Neighboring peer governments have balances of 20 percent, on average. These comparisons underscore the need to shore up reserves in the near term in order to preserve the County’s high credit ratings. The County Board will vote on the Manager’s closeout recommendations at its November meeting. At that time, the Board will also issue its guidance to the Manager as he develops a proposed budget for FY 2020. Share feedback on the Manager’s closeout recommendations by emailing dmf@arlingtonva.us. Comments will be compiled and shared with the County Board. Read the staff report and watch the presentation made to the Board at its Saturday, Oct. 20 Regular Meeting. Scroll down to Item No. 30. Visit us online to learn more about the FY 2020 budget process. A movie theater and grocery store are approved for Crystal Square, in the heart of Crystal City.